WASHINGTON — Roy Moore could do more damage to the GOP brand than an Alabama Senate seat is worth. That's a major concern for Republicans as Moore tries to weather allegations, reported by the Washington Post, that he initiated a sexual encounter with a 14-year-old girl in 1979 when he was 32, and others in the GOP try to figure out how best to handle the political bombshell. NBC News has not confirmed that allegations; the woman didn't file a police report or bring a civil suit. Moore, now 70, called the charges "completely false" in a statement released by his campaign Thursday. It's a "no-win situation through and through" for the GOP, said Doug Heye, a former Senate and House Republican aide. Either Moore loses the seat to Democrat Doug Jones in next month's special election, further imperiling the GOP agenda in Congress, or he wins it and puts other Republican candidates in jeopardy in next year's mid-term elections. "He's not worth it," Heye said. The question of how to handle Moore has both political and moral components, said Republicans who spoke to NBC News on Friday. Some aren't waiting for more information. "It is not acceptable to have this man as the face of the party in any state," Michael Steel, who served as the spokesman for former House Speaker John Boehner, said on MSNBC's "Andrea Mitchell Reports" on Friday. Former Louisiana Sen. John Breaux, a Democrat, said the allegations — what he termed the "girl problem" —could have serious repercussions for the Republican Party well beyond Alabama if he wins the race and is seated in the Senate. "What does that say about the party?" he asked. "Basically, a child molester is going to be a United States senator." Coupled with Moore's alignment with former White House chief strategist Steve Bannon, who has declared war against the Senate Republican leadership, the allegations mean that Moore will be "a perpetual thorn in their side," Breaux said. The calculus may be a little different for sitting Republican senators, though, because they can ill afford to thin their ranks when Sen. Luther Strange, who was defeated by Moore in a special election primary for the seat left open by Attorney General Jeff Sessions, departs the chamber. With a 52-seat majority, they need every vote they can get to push through a major rewrite of the tax code. If they fail, many Republicans say, they'll have little or nothing to run on in the mid-terms. Several GOP senators have said Moore should withdraw only if the Washington Post report is accurate. "If these allegations are true, Roy Moore should step aside for all the obvious reasons," Senate Majority Leader Mitch McConnell, R-Ky., said Thursday. "Very disturbing allegations." 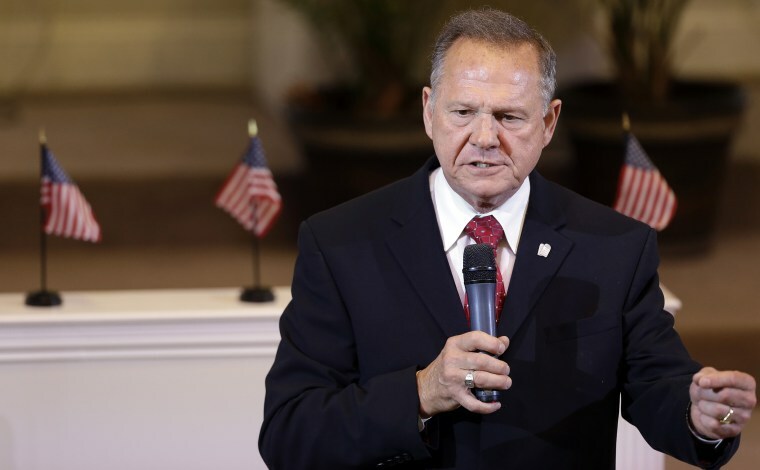 Amber Marchand, a former spokeswoman for the National Republican Senatorial Committee, said she thinks that mantra is the appropriate stance for GOP lawmakers and that the Moore controversy won't spill over into other Senate races. "Senate Republicans have done the right thing, speaking out in light of these very troubling allegations," she said. "Ultimately, I don't believe this is a deciding factor in the 2018 midterms." But there are signs that the GOP dam is starting to break. 2012 Republican presidential nominee Mitt Romney called on Moore to drop out Friday. And, in an interview with MSNBC's Kristen Welker, Rep. Peter King, R-N.Y., said Moore doesn't have much time to offer a rebuttal. "Ordinarily, Kristen, the person is entitled to the presumption of innocence, but in this case the charge is so serious, and the fact that it's backed up by other women and it's so hideous," King said. "I would say, unless he can prove his innocence the burden is now on him, within the next day or so I believe he has to step down. He owes it to himself, he owes it to the state, and he owes it to the US Senate."